Time spent trying to please your boss is processing waste and provides no value to your customers. Leaders and staff need to recognize this as a major cultural problem because it will negatively affect the long-term success for your organization. Leadership: how much time do your people spend trying to please you versus getting the desired results? Are they experts at managing their leaders and mediocre at doing the actual thing? Are they getting good at the job or managing up? I’ve found a tremendous amount of time can be wasted by approval seeking within a company. Powerpoint, meetings, and calls devoted to finding a sense of confidence in the organization, not doing the actual thing. In my experience, most leaders are not people who consciously demand this sort of activity, but it often persists because those that manage up often receive public praise and promotions. You would be surprised how much time is spent when staff feel the need to game the system to look good for the boss. Think about how that time could be better spent doing Kaizen! Spend time assessing for “managing up” behavior. It will be a challenging improvement because the causes will be deeply embedded in the system. The benefit will be a clearer focus on the customer, freed up time to use in creating value, and capacity for future improvements. Embrace The Kaizen Spirit: Masaaki Imai says “The Kaizen spirit encourages thinking about how to change, rather than why it can’t be done.” Don’t let the excuses (even really good ones) hold you back from looking to find a way to make a difference. As Mark Graban suggested recently, let the identified barriers become your first problem statement. See How Your Role Makes A Difference: Seek to discover how your role directly makes things better for customers or how it supports those that interact with them. Also consider what you can do to make a difference with the people on your team by being a better listener, encourager, or other things that help people make improvements. Be Approachable: If people avoid talking with you, you can’t make a difference because you will not understand the current situation. Being inclusive allows you to build trust and begin to help influence positive changes. 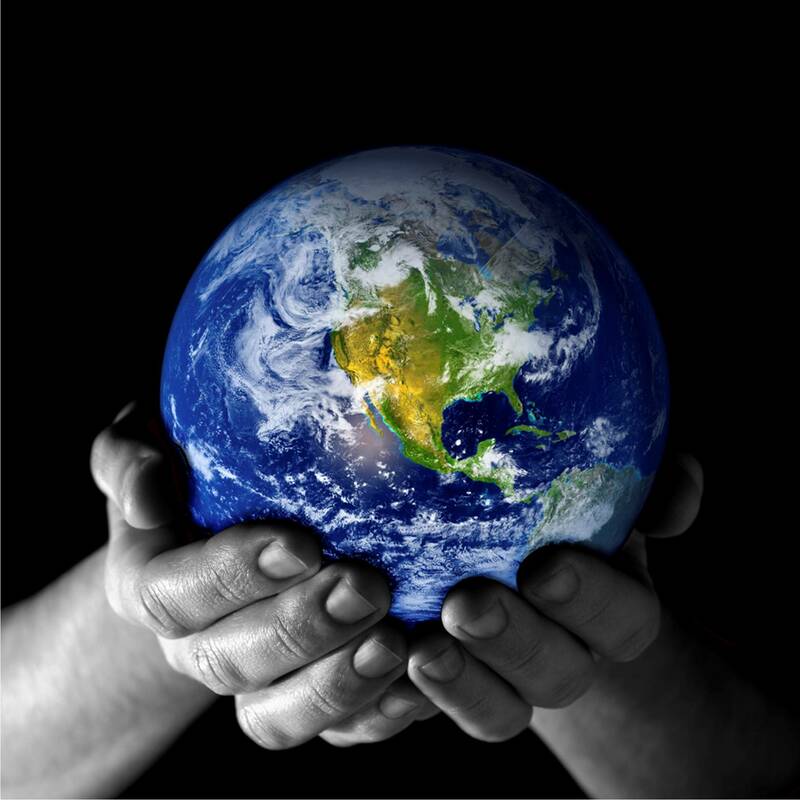 I am sure many of my readers are already making huge impacts on people’s lives and in the organizations they work with. 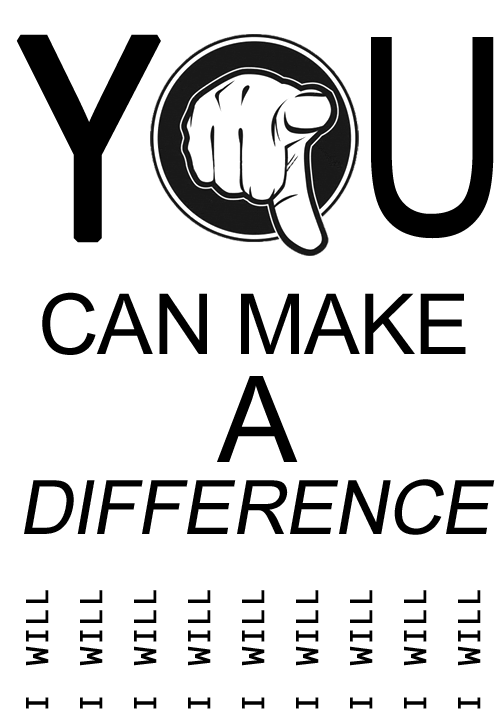 What other suggestions do you have for people to be a difference maker this year? Have you dreamed of eating the Grove Café’s world famous pancakes or been lucky enough to try them yourself? What? You never heard of them before now? It almost sounds like a classic Onion article. Many hospitals aspire to be “World Class” but there is no measure to know if they succeed at it. Just like the pancakes, only that hospital seems to define themselves as achieving that level of success. For that matter, I am not sure what would make them stand out with that definition since a Google search of “world class” and hospital returned 47,300,000 results. Do patients choose a hospital based on a world class definition? Similarly, do local “top doctor” magazines drive patients to hospitals or is the US NEWS” Top Hospitals” issue a key deciding factor (despite its questionable criteria)? I would worry about achieving the level of “World Class” (whatever that actually means) since being at the top of a benchmark usually does not inspire people to improve once attained. I think a better mission for hospitals is to strive for “perfect care”. Patients deserve predictable clinical outcomes and they shouldn’t get harmed or sicker by being in a hospital. Patients want better customer service and should not have to experience any unnecessary waits. Lastly, healthcare should have a fair and reasonable price for their co-pay and insurance. Hospitals need to ask their patients if they want to be treated at someplace famous or where they will receive perfect care. If forced to choose one over the other, which would they pick? Focusing on the means (providing perfect care) will help hospitals achieve outcome of being deemed world class. 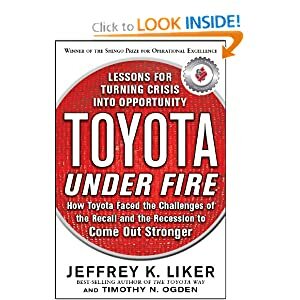 “Toyota Under Fire” by Jeffrey Liker and Timothy Ogden is a highly recommended book for leaders, Lean-thinkers, and people interested in media criticism. I initially thought it would solely be about the recall crisis which NASA has already vindicated the company. The book also details the challenges faced by Toyota during the recession. The authors provide candid information about how the company could have done better and show how they turned the crisis into an opportunity to become stronger. The final chapter transforms Toyota’s story during the crisis into lessons other organizations can use to help them be prepared for a crisis. The book helped understand the power of the Toyota Way and reaffirms why they are a company to be admired. There are many great insights into the thinking of the people in the organization. Some of my favorites were about how deeply respect for people is practiced, the examples of how important it is to be close to the problem to be able to improve it, the importance of culture, and how the five why’s were used to accept responsibility of the problem. For those interested in media criticism, this book provides a lot of data that was distorted or omitted in the news during the recalls. The examples of sensationalized reports with no follow-through once disproven will serve as a reminder to take what we consume from the news with a grain of salt. One thing I found surprising in the book is that many cited sources were from bloggers and websites. Since the traditional media seemed slanted against Toyota, these other sources appear more neutral. Liker and Ogden’s book show how Toyota practices the Toyota Way. It is not just about theory and philosophy but a demonstration of how it was recently done. This was an excellent book. Disclosure: A review copy of this book was provided to me by the publisher. How Do You Deal With Service Problems? If your customers are unhappy with your service or quality, how do you deal with it? During my wife’s pregnancy, she craved burgers and onion rings from a large chain that sells gourmet burgers. She was very specific on what she wanted – plain, very well done with no pink, blue cheese, and cut down the middle to ensure it is done. Instead of the normal fries, she always wanted the onion rings. I would call ahead and fetch the food to bring home. I can think of six times in the nine months where the order was wrong. One of the elements she required usually did not make it into our to-go box. After the first few times of arriving home with a wrong order, I began opening up all of my boxes in the restaurant to inspect and still found errors. I began prefacing my call-in to tell the person the common problems I have experienced and still did not get the right thing. Why did I keep going back? The management apologized profusely and always gave me my food for free. As a customer, I know the company will always take care of me. This is a plus for them. On the flip side, what else could the burger joint do to handle problems? If they were committed to continuous improvement, they could use the event of paying for someone’s meal as an opportunity to ensure the problem never happens again. The manager could have a chef hand out the free gift card for a non-well-done burger to help them see what the customer is experiencing. This will help gain committment for change. For the times when the person taking the order over the phone did not put in the substitute for onion rings, the leader can work with the person to identify what caused the problem (maybe entry screen is unclear or inoperable, maybe the process is to just verbalize the substitution to the chef). Do you think real-time problem solving can be done in a high-volume restaurant or is the immediate counter-measure of giving food for free the best they can do? I recently discovered this funny online webcomic 1.00 FTE. This particular one reminds me of the waste of overburdening people. An unreasonable request is made to a team and escalation is conducted to force it to action. What is a better way to meet with senior management about this? Bring the senior leader to watch and talk with the team (gemba) to find out why they can not do the task. There may be waste causing them to not be able to complete the task. They may not have the resources or skills. There may be other barriers for them. Deeply understand the task that is being requested. The task may not fit into the organization’s strategy or help your customer. The task might not be worth doing right now (or ever). It may just be someone’s pet project. The team may have bigger priorities. New IV Ports – One nurse had trouble connecting an IV port on my wife during labor. She exclaimed “they changed our ports a few months ago but we kept on using the old ones. Now the old ports have been thrown away and we are forced to use the new ones. I don’t see why they switched them.” Another RN mentioned the ports later and said “I was on vacation when the ports changed so I never got the training for how to use them”. Lack Of Patient Centered Care – Our OB seemed to have an agenda on the day of labor and increased medications without telling us first despite our birth plan and previous conversations requesting informed consent for things like this. The OB was using scare tactics to push for a c-section without explaining pros and cons for alternatives. Pediatrician Office Visit Late – For our one month check-up the pediatrician was 20 minutes late. The doctor looked visibly flustered and distracted. He apologized for running late and expressed how bad he feels to be running behind and hates to make people wait. What Is Up With Our Hospital Bill? – The day before we discharged, a person provided an estimated amount and asked for a credit card. A month later we get a bill in the mail for half the amount we already paid without any indication our initial payment was credited towards anything. I called their billing customer support only to be told the initial credit card amount was applied later in the day that my bill was mailed. The rep told me the lower bill we got in the mail was incorrect and we really owed the larger amount we originally paid for with a credit card (plus an additional $68). Lean transformations can help each of these situations. Using better training, job instruction sheets, and explaining why would help the nurses with their ports (although I question what prompted the change if they were allowed to use the old ports for a few months if someone claimed safety was the reason). Helping providers understand what their patient’s wants and needs are will allow them to better serve their community and will most likely help with growth. Doctors can have reduced stress and better engagement if the root causes for being late for appointments are improved. Lastly, recognition that the patient experience usually ends once everything is paid can help improve billing accuracy/clarity and save money from rework due to patients calling in to ask about their bill. With renewed energy and passion I return to work to help those in hospitals see the opportunities all around them while providing guidance for how to capitalize on them. Since my work banned access to twitter, it is not as easy to share great Lean related articles. I will do this on my blog now! Failure vs. Mediocrity – Dan Pink has a great thought about the creeping disease of mediocrity. How To Scold Like A Kaizen Sensei – Jon Miller explains the heart of scolding, something that surprised me in the Birth Of Lean book. Lost In The Land Of Firefighting – This short video shows how we can easily lose sight when putting out fires. I think it also shows why gemba walks need to be done instead of those doing the work saying “I already know it because I do it everyday”. An Idea Is Not Always Enough – Jamie Flinchbaugh uses an Aesop fable to demonstrate the importance of taking action on an idea instead of just talking about it. Of 777s and Heart Rate Monitors – Mark Graban tells a story about a hospital death due to a heart monitor being turned off and illustrating the need for error-proofing. Who’s Most Responsible for KPO Development? The KPO! – Mark Hamel encourages KPO offices to have intellectual curiosity to the point of obsession to be able to develop itself. Mocking Boards – Mike Wroblewski’s post demonstrates the effects of making problem’s visible. What does it take to be a Lean Manager? – Tim McMahon gives some practical advice for what makes a Lean manager. Magical Street Graffiti – 35 Breathtaking Illusions!! – Not Lean but the artwork is amazing! Youngme Moon is coming out with a book called DIFFERENT. The attached 3 minute video (RSS readers may need to open post to view) gives a great visual overview of how businesses can be different. The video was created by XPLANE, a company that I enjoy their visual communication. The book looks like something the Lean community would enjoy. Mark Graban’s “Lean Hospitals” is a must-read for any hospital going through a Lean transformation. I recommend it for all staff and not just leadership. I am an internal consultant in a Lean hospital. One of the biggest challenges is helping clinical staff understand how stuff from the automotive industry and manufacturing is relevant to their work. Mark’s book provides descriptions and case examples that tie the Lean philosophy and tools directly to hospital work. A strength of the book is the realistic way to approach Lean in a hospital. There are many nuances for standardized work that are valuable. Wastes are identified as things people in hospitals experience. Mark points out common issues faced by hospitals if you are looking for a place to start. I can not emphasize enough how many valuable tidbits are throughout this book. Leaders will get a lot from this book. Lean requires management to change in order to support front-line improvements. Mark provides many concrete things leaders can do to make their journey successful. The continued focus of patient needs and employee engagement drives all aspects of the book. This brings purpose behind everything else that is explained. This book will help drive valuable change for hospitals. Get the first chapter for free here. See a video with the author here. Follow Mark Graban on his blog andor twitter. Being an internal lean consultant at a hospital has some challenges. In my consulting practice, I find countermeasures vary greatly depending on relationship with client and what stage they are on in their Lean journey. Below are a couple of challenges to which I am still trying to discover my best approach. I love what I do and things like this make everyday exciting. Pair of hands consultant versus collaborative consultant – A good portion of my clients initially expect the internal consultants to go and do for them. They want their people involved in an improvement event but claim too busy or too understaffed when resources are needed for assessment, planning, and sustaining. As a collaborative consultant I try to do as much WITH the client instead of FOR the client so they can be engaged and learn how to do this work themselves in the future. I really see a lot of people struggling with this collaborative model. Physician culture can be a tough nut to crack – While we have some excellent physician Lean champions, there are still a fair number of doctors that are not fully committed to the journey yet. Providers are incredibly smart and independent. They have a lot of goals such as providing excellent patient care, doing research, writing/publishing papers, and educating Residents/Fellows. Sometimes the systems-thinking focus and overall patient flow is not a top priority for them. Some incentive plans make them compete against each other for surgical time so they are less likely to share best practices with each other. The “what is in it for me” part isn’t always an easy answer if a focus on the patient doesn’t seem to be enough. Have you experienced either of these? Do you have a best practice? Is everything really a case-by-case issue (get to root cause for each individual)? As someone who helps people improve their processes and quality for a living, being a consumer can sometimes drive me batty! I think there will always be a need for the lean principles to be applied (although some companies do not recognize the need). My wife and I recently purchased new windows for our whole house and have had cascading problems since. The sales person did a quote while we were at work and mailed it to us. To understand what the windows he quoted were, we visited the showroom and the sales person showed us a double-hung window where both the top and bottom opened. We advised we wanted the energy-efficient and gas-filled glass. We pointed out the measurements on the quote weren’t correct so he was going to send someone out again and provide us with a more accurate quote. The updated quote came and the price was good so we agreed via telephone. During the day of the first installation I stayed out of the way from the crew. I popped out at one point to see one of the windows that was finished. 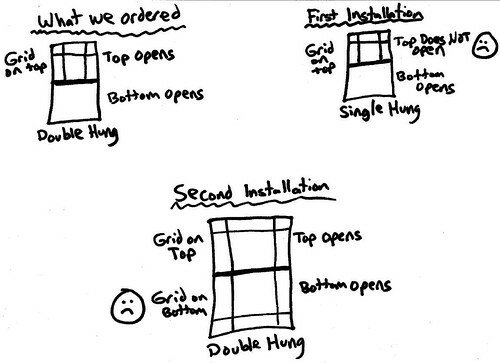 It was a single-hung window where the top did not open like I ordered! I called the salesperson who was very rude stating it was on the quote I agreed to. I advised it was not the window my wife and I saw in the showroom. He said that was just a demo of the window brand and we were not clear to him we wanted double-hung. I asked where it said on the quote that it was single hung to alert me as a customer that I might not be getting what I expected. He said next to each measurement is the code “SH” for single hung. I advised him that as the window expert, I would have expected him to explain technical codes to me the consumer and asked why he would not have tried to up-sell me on the more expensive window anyways. We eventually came to agreement to get the correct custom windows installed. This was truly a test of my respect for people principle! The installers have to send their crew out twice (you will find out it will be three times in part 2!). The single-hung custom windows are now scrap cost to the installer and/or manufacturer. The time the salesperson spent fixing our problem took time away from him to generate new business for the installation company. Potential counter-measures: 1) Train salespeople to ask customer’s the right kind of questions to ensure their needs are met prior to ordering. 2) Make quotes visual with descriptions with explicit explanations with no code so the customer can understand what they are agreeing to. 3) Don’t blame the customer when problems happen but own the issue. I will share part 2 next week. Any other wastes or counter-measures you see in this story? Inflexible staff responsibilities and lack of cross-training leads to customer waiting. Simple changes can help your organization easily achieve customer satisfaction. My wife and I rented a car for our vacation last week and experienced a very unnecessary 20 minute wait to return our car. This company definitely was not a Lean Enterprise. The rent-a-car location has two connected offices. One office was for Cars and the other was Trucks. We returned the car about an hour after it opened only to see a sign on the locked door for the cars division stating they were dropping off a customer and to call a number if needed. We called the number and was advised the Car Division employee would return in 20-25 minutes. We went into the Trucks Division office and two employees were talking together. They were not on the computer or phone. They advised they can only take the keys from us but could not give a receipt or change the credit card like we wanted to. About five minutes later, a guy in coveralls drove up and parked behind the building. We saw him enter a back door of the Cars Division. We knocked on the glass and the new guy advised us he just takes care of the cars and would only be able to take the keys from us. After 20 minutes, the Cars Division salesperson showed up and took care of us. Our waiting could have been avoided by having more flexibility between divisions. If the Truck staff was not silioed and was able to cover the Cars returns while they dropped off a customer, we would have been more satisfied. From our perspective, the employees all worked for the same company and I did not care if they were in different divisions. Another way to avoid customer wait would be to provide credit card and return authority to the person who takes care of the cars. If the company is hiring people who they do not trust with customer credit cards to take care of the cars, then I seriously worry about the quality of the vehicle I am renting. This experience just drives home the importance of physically going to see how your customers interact with your company and products. The contermeasures I provided are simple and easy to implement but you have to see the problem to know it is a problem. Lean thinking is focused on the cusotmer. This quote help reinforce this perspective.